Dr. Jose Rizal Off-Leash Area reconfiguration. Click on this image to see a larger PDF of the area. The reconfiguration of the Dr. Jose Rizal Park Off-Leash Area (OLA) has been announced. OLA suppporters had feared that the 5-acre dog area would be reduced to 1.5 acres in the new site design, but after community input, Seattle Parks and Recreation announced that the reconfiguration would give the OLA a 4.1 acre space. This would provide about the same amount of usable space as the previous site had, since part of the previous site was inaccessible. 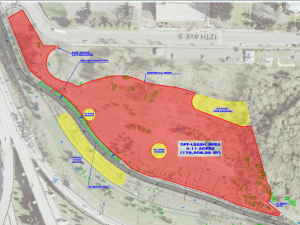 Thank you for your participation in our efforts to reconfigure the Dr. Jose Rizal Park off-leash area to accommodate the new Mountains to Sound Greenway Trail. We listened to what you told us in the recent public meeting, and I’m very pleased to let you know that Parks staff have identified a 4.1 acre area that maximizes the available, usable space in the park to serve as our off-leash area. To see the new configuration, please see the attached schematic. Thinning the quaking aspen and birch trees. This thinning, consistent with Crime Prevention through Environmental Design (CPTED) principles, improves sight lines in the park, both within and outside the off-leash area. It also gives the remaining trees the opportunity to thrive and creates more usable space in the off-leash area. Along with volunteers from Beacon Area Neighbors, maintenance crews cleared approximately 1.5 acres of blackberries, which also creates more usable spaces within the off-leash area. Another amenity is that the trail will be lighted, and some of that light will spill over into the off-leash area, as the buffer between the trail and the off-leash area is 15 feet. This will make the site more usable during the months when days are short. We are optimistic that the positive presence of walkers, runners and cyclists on the trail will bring a new energy to the park that will make the off-leash area more of a destination than it has been in the past, and that the presence of trail and off-leash area users will lead to more community use of the park. The newly configured off-leash area will be completely fenced. It will retain the double gates at the northeast area and Parks will add another set of double gates to provide access from the trail. As requested, Parks will install a lower hose bib for the fountain and will add signage indicating the presence of the off-leash area. If users are interested in creating a “small and shy” dog area within the off-leash area, the northeast corner would lend itself to that use. I’m also pleased that our off-leash program continues to grow. It’s a popular and successful program that has become woven into the fabric of Seattle parks. We began in 1995 with seven sites. Today we have 11 and three more in the works at Lower Kinnear Park, Magnolia Manor Park, and a soon to be decided temporary site in the South Lake Union neighborhood to serve dog owners while we seek a permanent site). Early in 2011, Parks conducted an online survey to ask off-leash area users what small-scale improvements they would like to see. People suggested projects ranging from small and relatively inexpensive projects such as signage, new plants, tree protection, sub-areas for small dogs, mulching, and plastic bags to large and expensive projects such as drainage improvements, resurfacing, and lighting. In response to the results of that survey, Parks maintenance and planning staff and the Off-Leash Areas Manager, Brenda Kramer, have met to begin setting priorities among those ideas and identifying fund sources available to get some of them done. We look forward to working with COLA on those improvements. Parks also looks forward to working with COLA to sign up new stewards for the site. Thank you again for your participation in this process.